The MR-70 Master Recorder is the result of three years of research, testing, and development, during which Ampex engineers worked closely with key individuals in the Recording Industry. Their common objective was to establish new standards of performance, reliability and operating convenience in a master recorder. The result is the Ampex MR-70 a totally new master recorder with major design innovations that meet the exacting requirements of the Recording Industry. The MR-70 has no equal in total performance. No effort was spared in its design and development to fulfill the demands of the recording industry in producing the finest quality mono- phonic and stereo masters. With today's low noise tapes, an improvement in broad band (20 cps to 15 kc) signal-to-noise ratio of 10 db is realised over previous specifications. The electronics of the MR-70 are capable of even higher performance with future tape improvements. Frequency modulation noise ("scrape flutter") is virtually eliminated through unique design of the head assembly, employing a precision idler in the critical unsupported tape path, reducing the unsupported tape path length. Components are permanently aligned to the most rigid and massive heavy-ribbed casting ever used in an audio recorder, assuring stability and precision of tape motion and tape tracking throughout the long life of the recorder. Tape speed is "repeatable" and identical from reel to reel, and from day to day, even if recorder is moved between recording sessions. A constant hold-back tension system maintains constant tape speed and alignment from beginning to end of reel. Viscous damped reel idler (a "floating" flywheel in an oil-filled shell) reduces wow. Dynamic range is assured by generous electronic overload margin. Distortion, 25 db above operating levels, is less than 1% from 30 cps to 15 kc. Distortion, at tape saturation level (14 db above operating level), is less than 1% from 30 cps to 15 kc. A balanced 150 kc master oscillator in the transport drives a feedback-stabiliied bias and erase amplifier in each electronics, and maintains low noise and absence of even order distortion. The resulting symmetrical bias waveform eliminates the need for a "noise balance" control. The 150 kc bias frequency minimizes audible beats between the bias and the harmonics of high frequency signals. Stray bias signals in the output line are kept 40 db below operating level. Convenience and ease of operation are key advantages of the MR-70. From variable speed winding and rewinding to facilities for easy editing, the MR-70 was designed with the operator in mind. Foundational text and photos courtesy of Ampex Corporation. Video courtesy of Roger DiVito. 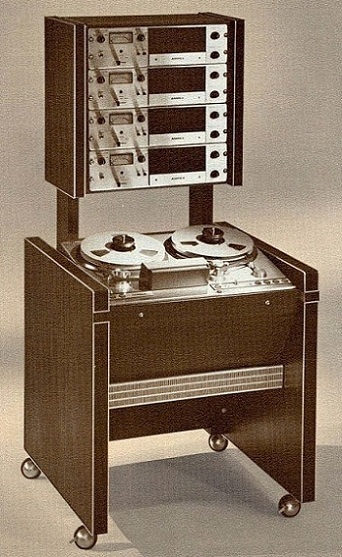 Do you have content, to add, about the Ampex MR-70 Tape Machine or associated topics? Please feel free to Share it, here!